Today I am feeling manic, and that means I am finding it hard to sleep. Yesterday, I was awake all day, and when Graham went to bed, I just didn't feel like sleeping too. Of course, I did try, but after a couple of hours, I realised my body just wasn't going to cooperate. At other points in my life this has been really frustrating, as I used to worry about being alert for work, but at the moment, as I'm unemployed (or funemployed, as I've heard it termed), I am really not bothered. In fact, I've found some real benefits to being awake when others are asleep. Benefits I want to share with you for the next time you also may be experiencing insomnia. I can listen to any music I like, without worrying about boring anyone else. Graham is very tolerant of my listening habits, but it's nice to know after he's asleep that no-one is going to be worried if I obsess about a particular song. I can play Owl City's "Saltwater Room" 10 times in a row if I want, and no-one can stop me! I can go outside in the dark. It's summer here in Perth, and the nights rarely fall below 25 degrees Celsius. Perfect for sitting outside looking at the stars. I love the stars, even though I can only identify one constellation, and I don't even know what that's called. I can't even find the Southern Cross - and, seriously, when one looks for that, EVERYTHING seems to form the cross shape. How am I meant to find it then? I can also go in the pool if I want. I mean, I never put my swimming costume on and get in properly (what if there's monsters in the pool filter?! ), but I am perfectly fine with dipping my feet in while I drink a cold drink. No sunburn, no unbearable heat, just a comforting warm and the cool of the water. And that cold drink? Well, that leads me to my next point. I can raid the fridge, and no-one will bother me. Seeing as I get my sleep during the daylight hours while Graham is at work, dinner becomes my breakfast, and my other two meals consist of whatever I can find in the pantry or fridge. Am I really hungry? I can make custard with bananas from scratch if I want, or soup, or leftovers. I do have to be careful about the microwave noise, but I've become an expert at stopping it before it makes that loud "ding!" noise at the end. Am I just hot and bothered? I can raid the freezer for icypoles, or drink that last soft drink in the fridge without feeling guilty that I'm depriving someone else. I can watch all the YouTube videos I want after midnight. Free internet is awesome! And I can watch all the episodes of Life In Cold Blood back to back if I want, or get creeped out by the parasites in Monsters Inside Me, or catch up on episodes of My Little Pony. Anything too big for me to download during the day, every show Graham's not interested in watching, it goes on my insomnia list. I find it easier to think at night. Somehow, I get the best blog posts after midnight. And I have lots of quiet time in which to type. And when I find I need a break, I just surf the net, or open Photoshop for some art time, or watch the PowerPuff Girls. All those things I find I feel slightly guilty about doing during the day, when washing and cleaning and other jobs await me. And of course, there are all the usual benefits of being up late at night. No telemarketers call, the dogs are sleepy, and the house is quiet. It's peaceful, and I enjoy it. Really, the only downside is that when I want to talk with people, I have to wait for them to be awake. I don't think people appreciate it if I call them in the very early morning. In this way, I spend my sleepless nights. I keep myself busy until 5 AM, when Graham's alarm goes off, and I jump back into bed for a quick cuddle. He then goes for his shower, while I, all clean and cool and finally tired, stretch out in the middle of the queen bed... and finally go to sleep. I sleep for 8 to 10 hours, and then wake up, refreshed and alert, as Graham arrives home from work. 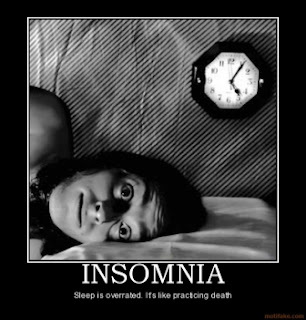 Insomnia is not ideal. I would live my life without it if I could. But it's nice at this time that I am able to enjoy some aspects of being awake when the rest of the world is sleeping. Next time you are unable to sleep, try some of things I mentioned - somehow these experiences are different at night! Or simply see if I am awake to commiserate with you. Because if I miss anything during my manic vigils, it is friends to share them with. Given the chance I am a night owl myself, and I love being able to stay up at night when it's dark and cool. Unfortunately I have a day job that demands very long hours and so by 9:30pm sleep beckons and I end up knocked out until the next morning when it all starts again. I really want to try polyphasic sleep one day so I can make use of all the hours each day has to offer without having to spend so long unconscious, but alas that needs must wait until I am self-employed and life is flexible enough to allow for it. I actually love the feeling of being exhausted and able to finally drift off to sleep. It's just that in summer, that drifting happens best in the very early morning! I do wonder if polyphasic sleep really works! I have never met anyone who claims to have even tried it, let alone made it work. Maybe I should research further? *raises hand* NIght owl, here. I prefer the night. Not so hot. Nice and quiet.. and a stillness that I love. And the best part is being able to see both the sunset and sunrise if you want! When I was in the convent, I had this really strange sadness that would creep over me when I realised that, should I stay in the convent forever, I would never see a sunrise ever again - because they were always in the chapel singing at that time. Now, I prize my sunrises and sunsets. You never know how many you will get to see!